This is not the post I was planning on writing, but God has a way of taking our plans and writing a different, even better story for us. I had hoped to share with you the news that my husband and I were joyfully expecting our 6th baby. We had told our children and a few family and close friends. We were so excited to go for an ultrasound to see the new little person inside my womb. A few days before my 13th week I started spotting. I tried not to panic. I comforted myself with thoughts that maybe I had done too much that day. But as the next day came and I was still spotting, I knew all too well that I was most likely miscarrying, although I was hoping against hope that there was some other explanation. Miscarriage is not something new to me. I want to go back 11 years and share with you of my first pregnancy and first miscarriage. This might get a little long but I feel I need to share the whole story before I share about my recent miscarriage. My husband and I had been married 4 months. We were super excited to start our family and were so happy to find out I was pregnant. Before I had gotten pregnant we were planning on going to Russia on a missions trip. My midwife gave me the go ahead and we continued with our plans. We had a great time ministering to the sweet Russian people through worship and the sharing of the word. One 12 year old boy in particular stole our heart and followed us around everywhere. We were so thrilled when he asked Jesus to forgive him of his sins and he decided to live his life for him. He didn't seem to have anyone else and clung to my husband and his new found faith. A few days before we were to come back to the states I started spotting. Since it was so minimal I wasn't that concerned until I talked to the other women on our trip. As we flew back home I continued to bleed more. Josh and I still hadn't wrapped our heads around the gravity of the situation. As soon as we got off the plane and into our car, I started cramping. We finally made it home. Not too long after arriving, the cramps got worse and I was having very strong painful contractions. It's one thing to go through labor pains and at the end be handed a beautiful, velvety soft new baby; it's quite another thing to be in labor and be empty handed. As I miscarried, Job's words came to me. It's easy to bless God's name and rejoice in him when life is going well, it's a whole different story to bless his name when you are going through difficult trials, when you are in pain, when life is not going how you expected...when life is being taken away from you. We went to the hospital and I had to painfully hear that yes, I had lost the baby. As we made our way to our car. My husband and I both broke down, sobbing into each other's arms as our dreams of having a baby were shattered. My husband never cries. I am the emotional one, but in that moment we shed our tears together. On our way home my husband got a revelation of what God did for us in sending us his son. We would have never freely gave up our child, yet God gave up his to save us. We thought of the sweet Russian boy who we would see in heaven some day and rejoiced that God had used us to share with him the love of Jesus. We were so thankful that we would see our baby again and that it didn't have to experience all the pain and sorrow in this life. It would go straight into Jesus' arms, but we would have never made that decision ourselves. The next week was very hard. We went through waves of shock and sorrow as the reality of not having our longed for baby hit us. Yet through it all, God picked us up and carried us in his arms. We felt his comfort all around us.Sweet friends and family came and brought us meals and we received many cards from people I didn't even know; sharing that they also had gone through this same loss. God gave us these verses that we held onto as we grieved. Although I never would have chosen to go through having a miscarriage; I know that God used it in such a powerful way in our lives. My husband and I's marriage grew so much stronger. We grew closer to each other and closer to God. We were able to empathise with others who had gone through miscarriage as well. We were able to experience the supernatural comfort and grace of God as he gently carried us through this hard time. Not too long after miscarrying I was standing in church during the worship service. They were singing the song "Blessed be the name of the Lord. "( by Matt Redman) It had just come out. I can't tell you how hard it was for me to sing those verses. As I chose to not only sing those words but mean them, tears streamed from my eyes. These weren't just words I was singing; this is what it meant to be a follower of Christ. God was doing a supernatural work in me. He was giving me the grace and strength to truly mean what I was singing. He was allowing me to declare that he was and is good, that he takes our ashes and makes them beautiful, that he works all things together for good, that he gives us joy in the midst of sorrow, that only he could bring life out of death. When I first became pregnant, miscarriage never entered my mind. You never think it will happen to you. But in this sinful, fallen world we live in; hard things happen... to all of us. 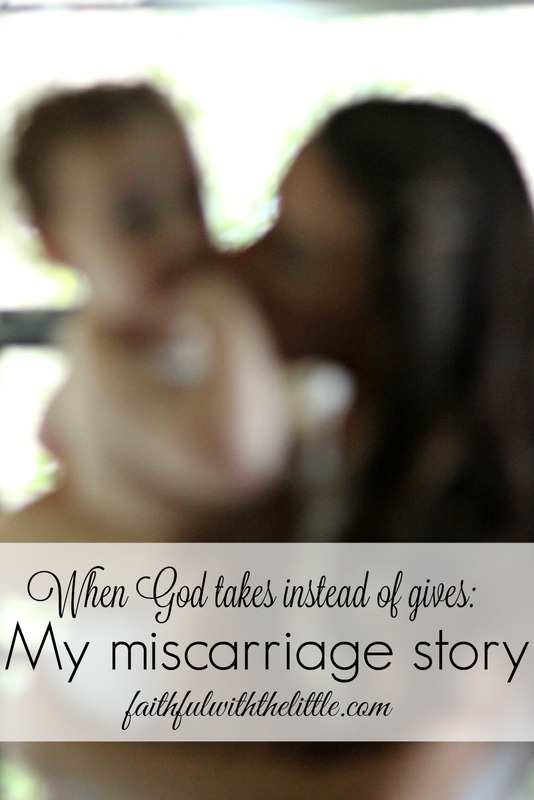 I have since come to meet so many women like myself who have experienced miscarriage. It is very common. No matter how careful and healthy you are during pregnancy; it can still happen. I believe it's God's way of taking care of a baby that just wasn't forming right. No matter how many children you have at the time of miscarriage it is still so hard. Each baby lost is a little life that is a part of your husband and yourself; apart of your family. Not only is it emotionally difficult, but physically painful as well. Whether you actually see your baby or not, it's life still has impact on you and is so precious. God had a purpose for it even if it didn't get to see the light of day. Back to the present: As my husband and I looked at the screen of the lifeless teeny tiny baby inside me; tears streamed from my eyes once again. No heartbeat. I had been feeling super well for the past couple of weeks and didn't seem to be forming that familiar big bump that I usually had by now. I had been worried, but chose not to obsess about it. Now I knew why. Now came the waiting. It was just horrible realizing that I had a baby in me that was no longer alive and that inevitably it was going to come out. God was so gracious to me during this time and of course my 5 crazies helped keep me preoccupied. I eventually miscarried about a week after I had first started spotting. Since the baby had died around 6/7 weeks the miscarriage was not as painful as my first one. My family and close friends have been lifting me up and prayer and let me tell you, I have literally felt their prayers. So thankful for the body of Christ during these times. It really is unexplainable that I can experience such peace and even joy during such a hard circumstance. God is so faithful to come alongside of us and reveal himself to us in ways we never imagined. He draws us ever closer to him...as we cling to him for hope and life. It's so hard to imagine how we could ever get through difficult times but when we actually go through them God's grace is so abundant. He has prepared us without us even realizing it. He allows us to mourn and grieve without losing hope. So here I am again... recovering from loss. I have to say that having 5 healthy children all around me has helped tremendously in lifting my spirits. It's hard not to laugh and smile when there is so much joy and laughter surrounding me. They have been so sweet and have been praying that the next baby we have will be healthy. Simeon said the other day with such excitement, "We are gonna see our baby in heaven!" and Ellie reminded me that, " At least you have us!"Yes! I am so blessed that sometimes I just can't contain it. One thing that this miscarriage has made me more aware of is that there are so many people going through hard things, whether we know about it or not. You might even follow my blog or my instagram account and think that my life looks great. Truly I do have such a great life, but there are things that all of us are going through that we can't always share with the whole world. It's not easy for me to share this story with you. It's very personal, but I know that there are others of you out there who maybe have lost a baby or are going through a difficult time. I want you to know that you are not alone and that God is able to bring you through it. Cling to him. Ask your believing friends and family to pray. Don't keep your pain and hurt to yourself. Allow the body of Christ to minister to you. God wants to take all that you have gone through and draw you closer to him. He wants to take your plans and make them even better than you could have imagined. He wants to use your story. He wants to teach you to bless his name...even when he takes away. I am so thankful as a believer in Christ to look forward to the day when I will be reunited with my loved ones in heaven and those little babes that my husband and I never got to meet. What an amazing reunion that will be! Have you experienced a miscarriage? What's your story? If you know someone who has just gone through a miscarriage don't be afraid to reach out and just tell them you are sorry and offer to pray for them. I am sorry for your losses. That pain is great but we know Who carries us through it and He is ever so faithful to care and comfort when our joy is at a loss. I have been through six over the past 28 years...it is a pain far too surreal. Gentle hugs. Thanks sweet friend! I know you can empathize. May God wrap you in His love and continue to help you through this loss. Thank you sweet Sarah! God has truly shown me his goodness through all of this. I'm sorry to hear about your recent sadness, but glad that your 5 lovely children have been such a blessing through it. I had a miscarriage the year before our eldest was born too, and also had never realised before how often it happens. Thank you for sharing your testimony and your encouragement with others, x. Thank you Gwen! Yes, I am so thankful for my full hands! It is courageous to tell hard stories, the ones that we can't write without tears flowing. And yet, your story will share the truth of God's comfort and grace in the midst of pain. Praying for you and your husband during this time. Thanks for your kind words and prayers Ginger! I am so sorry for your loss. I know how hard it is. Especially around this time of year. My husband and I lost twins and were delivering them 7 years ago today. I know that there are so many people that are hurting from similar stories. I also know that God is good and He is our comfort and peace through these situations. These trials come so we can minister to others and you did beautifully in this piece. I know it is hard to share your story but I am confident that you will help others in sharing what God's Grace has done for you. Many blessings and prayers for you and your family. I just miscarried yesterday. Even though it was a very early pregnancy at 5th week, the pain is real. It is my 1st pregnancy. Prior to conception, God spoke to me in October that I would conceive in 2 months' time. He even gave me a name to call her (Yes, i even knew I would be having a girl) which translated to mean "Grace". I was excited and expecting what God said to come to pass. True enough, I conceived in December and did a home pregnancy test last week and saw it coming up positive. I dreamt of my baby girl, a very sweet jovial girl staring and smiling at me. I was very excited and told my husband that we would be having a girl. 2 days back, I went to a gynae for a checkup. Although it was still early, my gynae managed to scan a sac and told us that everything seemed fine. I had no spotting at all and she told me to come back in 3 weeks' time to do another scan to listen to my baby's heartbeat. We were so thrilled. We held tightly onto the ultrasound image of the little sac and stepped out of the clinic feeling on clouds nine. We were finally becoming parents! But the happiness was unfortunately, short-lived. Yesterday morning I woke up feeling really uneasy. I just felt that something was probably wrong. I went to the toilet and realized that I was bleeding and it was light pink then brown discharge. Feeling frightened, I called out to my husband and he tried to calm me down. I immediately called the clinic and was told to come down that morning to grab some hormone pills to stabilize my pregnancy. The nurse assured me I would be fine and the bleeding would go. I went home feeling hopeful again. However, I started cramping and it became severe. I was bleeding and this time, fresh blood. I started bleeding profusely and clots of blood was coming off. At that instant, I knew my pregnancy had ended. I was crying inconsolably. I had no idea what I had done wrong to have miscarried. My husband and I prayed, submitting to God's will that if He is to take this baby away, we will submit. While praying, I had a vision of my baby girl in heaven pointing at us and telling a group of children that her daddy and mummy were praying for her. I knew then that my baby girl had gone to be with the Lord. I went to the hospital immediately and was confirmed to have miscarried. It was a painful experience because for the 2 months, I had been expecting this child to be born not to be taken away from me. It was hard for us to accept. But despite this, I went to attend church with my husband and were greatly blessed by the Praise and Worship, as well as the preaching which spoke so much to us. God again, showed me a vision. This time, I saw a vision of many children, probably hundreds and hundreds of thousands or millions. They are of all races, all nationality, both girls and boys. They looked so happy and free. They were playing and enjoying themselves. They seem to know each and every one of them. At that point of time, God impressed upon me that there is a special place in heaven dedicated to all these children who had died due to miscarriage or stillborn and each of them is special and important to Him. He even prompted me to pray for other mothers who are going through the same experience as me. I know it is hard to come to terms at times. If God gives, I asked myself frequently, why must He take it away? Despite so, I learn to trust God, learn to trust in His goodness and faithfulness. This separation is not eternal. I will see my baby girl one day in heaven and I know she is well-loved. I thank God that He allowed me to have a vision of my girl and know how she looks like. She is such a beautiful child with such joy in her eyes. I cannot wait to reunite with her one day. For now, I pray that for every one who goes through this will learn to seek comfort in God. He loves us and He is still a GOOD father. In the right time and season, we will have our own earthly children. Even if He gives and takes away, I will choose to praise His holy name. Love you, Rebekah. I know God wanted me to hear your story at this time and not right after my own miscarriage for some reason. Perhaps in hearing your strong Godly words and seeing your courageous soul I can feel more connected to my story. I have a tendency to push things away, but I know God wants me to feel my feelings and He will be right there with me helping me to be strong.